You are here: Home / News / Happy 10th Birthday! As far as I’m concerned, any day is a good day to have some cake. 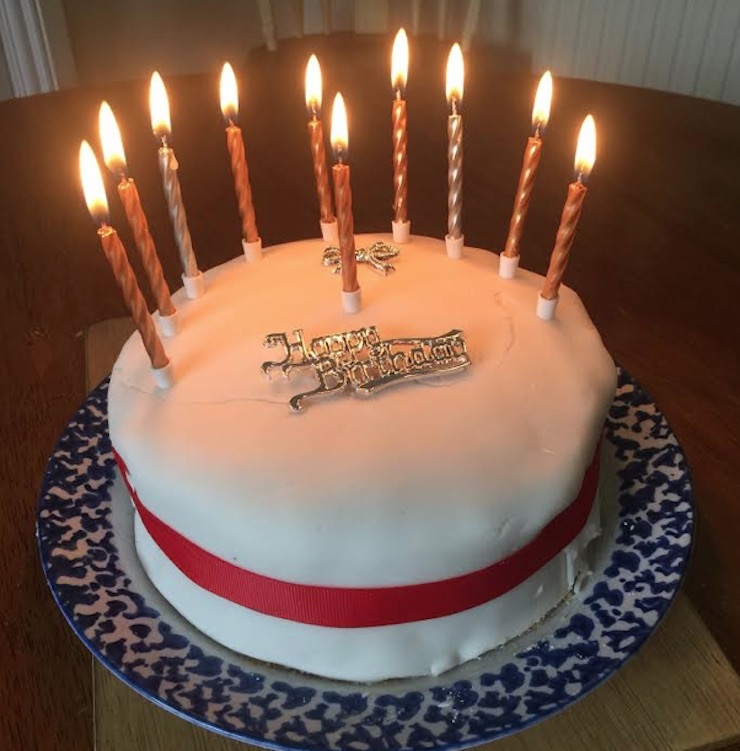 But there was a good reason to have birthday cake this weekend – Hoylake Junction is 10 years old! Yep, my little site about Hoylake has hung on in there and has made it to double figures. It was on 16th July 2007 that I published this rather random post about the (then neglected) model boating lake being drained. It then took me another month (nothing changes hey!) to publish a photo of a green buoy washed up on the sand. I’d sort of had the idea to publish a Hoylake blog for a while before July, 2007. I’d started to snap photos of the construction of the new lifeboat station and I shared some of them on the photo-sharing site Flickr. Soon afterwards came this site. I had every intention of publishing something yesterday. But after spending time fixing (finally, touch wood) a leaking toilet cistern, I decided to enjoy the sunshine for the rest of the day. My favourite Hoylake Junction topic over the years, without a doubt, has been the Friday Photo. I published the first of the series back in March 2009 (a modern-day image to start with) and over the years there’s been some really super photos that I’ve thoroughly enjoyed sharing with everyone. The old Hoylake photos have sparked something of an interest in local history for me, and that’s something I fancy pursuing in more detail. With umpteen thousands of visitors over the last 10 years, the site has received over 6,000 comments from readers both near and far. From Meols and Hoylake and around the UK, to America, Australia, New Zealand, Africa and elsewhere, people have made the effort to join the conversation. In addition, I’ve received thousands of emails on all sorts of different subjects. Some weeks there’s nothing to write about, other times I don’t find (make) the time. Other times a local story or event is covered by other sources and I don’t feel the need to publish a me-too article. The future? Well, it’s like running marathons. You just carry on going. It’ll be 10 years of the Friday Photo in March 2019 …now there’s a reason to have a big cake! Thanks for reading – it’s appreciated a lot. Nice comfortable site. Enjoy seeing topical info relevant to our area.. Well done. For us Hoylake expats it has been a wonderful way of keeping in touch with new happenings and sharing memories of times past. Thank you! Well done!! keep going. I even remember people from across the world who were kids in Hoylake with me, when they comment on a story. Hoylake is still a wonderful place to live and we all work hard to keep it so. Since I emigrated to the SE this site has been a wonderful way of staying in touch with west Wirral. Thank you very much for taking the time to keep it going. My week(s) wouldn’t be the same without the arbitrary arrival of the Hoylake Junction e-mail!! Thank you Mr Cronin – don’t ever stop. I heard that many years ago when the car park at the Railway Inn in Meols was being renovated that they unearthed part of a Viking boat, can anyone verify this story and if so where was it taken, I was born in Hoylake in the 1930s and used to play on the sand hills in Meols I remember the front part of a viking longboat being discovered by what was then known as monkey woods. I would be interested in hearing more about your your story as I had heard a similar one from 2 brothers who lived in Meols but have since psssed away. Happy birthday and wishes for many more great years. This Site is One of Wonderful I’ve ever visited. Happy Birthday, Hoylake, You’ve got a Long way to go.